A SINGLE LATCH FINGERPRINT DOOR LOCK WITH USER MANAGEMENT AND AUDIT TRAIL OPTION! The 1Touch evo3 provides cutting edge security with modern design sophistication. It’s the perfect lock for homes, small businesses, and rental property. Stop fumbling around in your pocket or purse looking for keys. Now all you need is one touch to unlock your door. It provides the wonderful convenience of never needing to use a key when you have your arms full. This lock assures only the people you want to have access to your home or business can get in. No more worrying about a past babysitter or employee having a secret copy of your keys. 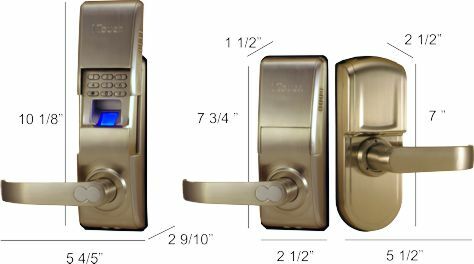 The high tech look of the biometric scanner lock not only enhances the appearance of your door it helps to intimidate would be criminals. We designed this lock to be a “Do-it-Yourself” solution for anyone who can handle a screwdriver and 4 AA batteries. The 1Touch evo3 comes in 2 user capacities (36 or 75) providing flexibility for home or business owners. The 1Touch evo3 allows 36 fingerprint and 78 passcodes users. It’s been a top seller for residential customers for years. This lock is designed to fit any US standard door. You can replace your current lock with a 1Touchevo3. Constructed with an all metal lock body these devices work just as well outdoors as they do indoors. With the quick & easy reversible handle design it’s a snap to move a lock from door to door or house to house if you move. The standard 1Touch evo3 (not the high capacity version) has the ability to record who opened the door and when. (Requires separately sold AT-Kit) If you want to know when the kids really came home Saturday night or when the contractors showed up for work then the 1Touchevo3 (audit trail capable) is the perfect product for you. The 1Touch evo3-HC is the perfect lock choice for small businesses and rental property managers who appreciate convenience and functionality. Featuring a fingerprint capacity of 75 people & 78 passcodes (does not record openings) allows for the device to be implemented in a wide array of uses. 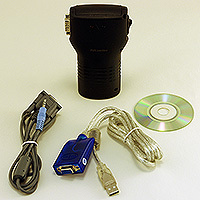 It can serve as the primary access point for a clinic or shop. These biometric locks are popular in hospital and pharmacies as a means of locking up dangerous drugs. Managing the enrolled users is done easily by simply using the numeric pin pad. It’s perfect for rental units as you will never need to change out a lock or try to get the keys back from a delinquent tenant. You simply go to the lock & delete them in seconds. Rest easy knowing your office, server room, medical closet or rental unit is biometrically secured. Door Thickness 1 3/8" to 2 1/2"